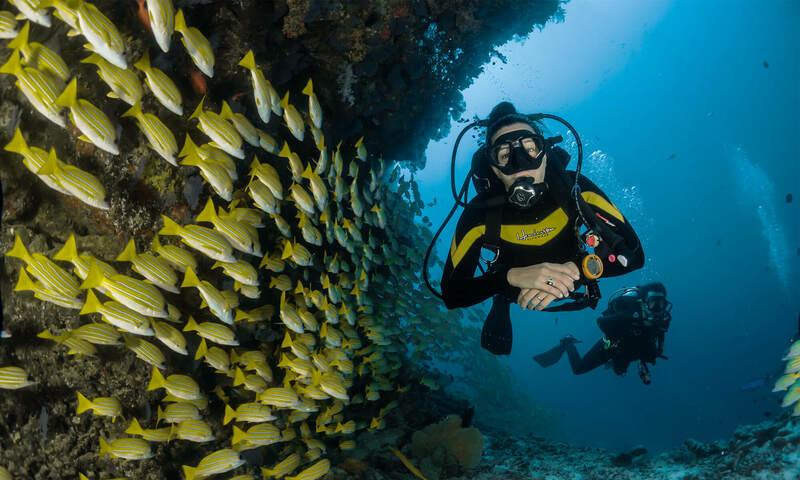 The PADI | SDI Open Water Diver and Advanced Open Water Package, its a Great choice! Where you can learn Diving better, than underwater? with this Package you will have 9 Dives in the Open Sea. 2 Certifications in 5 Days, to a max. Depth of 30m. The PADI / SDI Open Water Diver and Advanced Open Water Package, its a Great choice! Where you can learn Diving better, than underwater? with this Package you will have 9 Dives in the Open Sea. 2 Certifications in 5 Days, to a max. Depth of 30m. Open Water Diver eLearning, which you can already complete at home. As soon you arrive we will check what you learned. And komplete the necessary Paperwork. In the afternoon we will have our Swimmingpool Training followed by 4 Days with 9 Dives from the Boat. Day 1/2 Dives, Day 2/2Dives, Day 3/2 Dives and day 4/3 Dives. Deep Dive, Navigation Dive, Wreck dive, Nitrox Dive and Buoyancy Control. Rescue, Divemaster or Specialities like Nitrox Diver, Wreck Diver or Deep Diver. You can also join in in Technical Dive Programs if you reached around 25 Logged Dives. The Open Water Diver and Advance Open Water Package. Is the perfect choice for everyone to start straight forward and getting more experience.